Summer is usually a pretty boring time for Max, since he tends to melt in the heat. The heat has settled in for a couple of months, which leaves us searching for somewhere cool to visit, or sitting in the freezing air conditioner with the curtains drawn for him to stay cool. We think he would love the pool, but it isn't easy or safe for us to get him into the pool without a lift. And going to the many local running rivers is definitely not easy or safe for us to get him into. So, we try to make things exciting on the cooler days, or in the evening when the sun has gone down, or by bringing the fun to him. Last week, he got a visit from two friends from school. Max had asked for his friends to come color with him when school was out. 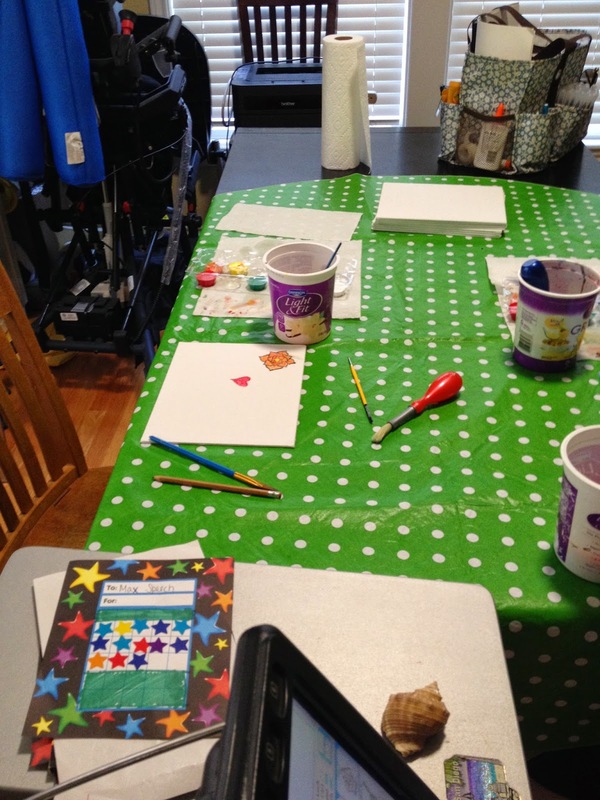 I set it up with their moms, and Max got to have an art session with them. 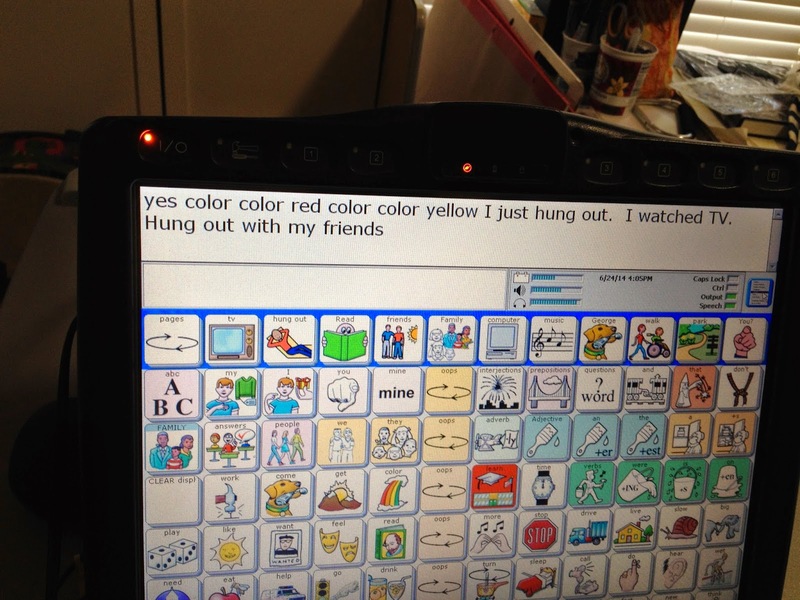 He had a wonderful time, and practiced using his computer to have conversations. 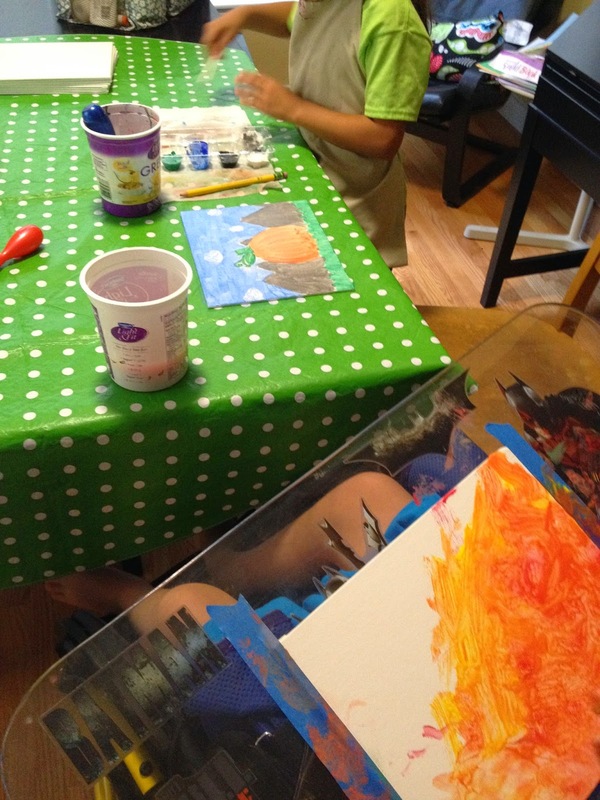 The girls worked on their paintings while Max worked on his. Max was full of smiles! He loves doing things with his friends! 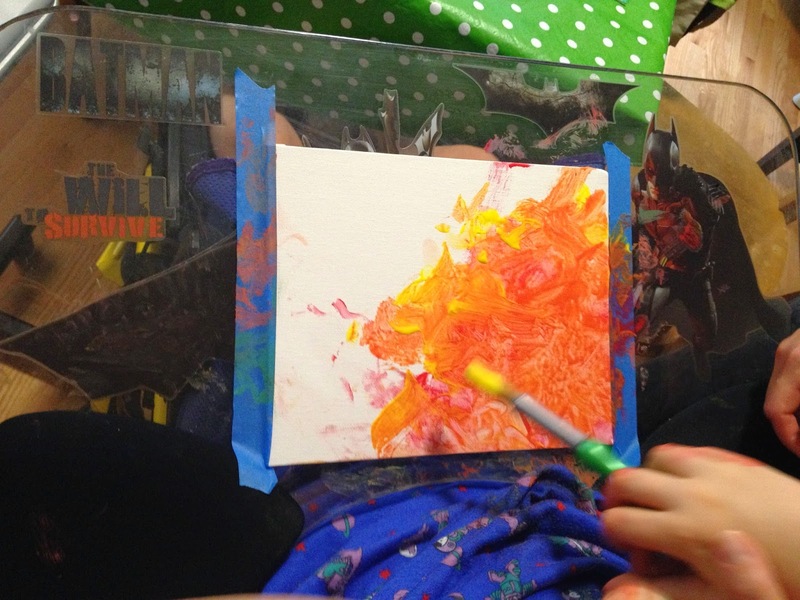 The girls made a couple of pictures each and Max cranked out a whopping four paintings! He chooses which color he would like to paint with. But then he broke into conversation with the girls, unprompted. He said, "Want to know what I've been doing?" They both said, "yeah" I said do you want to tell them what you've been doing so far this summer? He bit his hand which is a quick "yes." He said, "I just hung out. I watched TV. " Then got a huge smile and said "Hung out with my friends!" This is Max's fire painting. A pumpkin with the mountains. Max made four paintings, and got one left with him of Batman! We still have some bike rides we need to plan with friends, but first we have to get his batteries replaced on his bike. That's a whole lot of bike to push around without the assist! And we'll try for a few more play times with friends before the school year starts back up. Max has his first big Red Rocks concert this weekend! And of course, the 4th of July is always a fun night to walk around the neighborhood and watch fireworks! Now if we can just figure out how to bring back to cool weather! He looks happy there being an artist with his friends. I do wish you could find a pool that had a lift -- I see them all the time out here! That's because in California, public pools larger than 300 linear feet are required to have lifts! In Colorado, where we get to swim about 1 month a year comfortably, it's just not that high of demand. We need to get back to California to let him dig his toes in the sand and splash in the ocean!